Individuals and organizations seeking reputation management counseling require discretion and one-on-one coaching. As president of Foley Media Group, Ellen Foley meets privately on a 24/7 basis when crises occur or when longer term plans need strategic focus. Ellen’s 25-plus years as an executive and an editor, and many more years as a reporter, speaker, author and community leader brings unique assets to individuals or businesses who need to avoid the headlines or shine through them. Challenge: The Morgridge Center of Public Service, the University of Wisconsin-Madison center for volunteer opportunities and service learning, could no longer support in 2012 a key transportation program for student volunteers. A generous endowment at one time could pay the bills. However, dramatic increases in student involvement outpaced funds from the endowment. 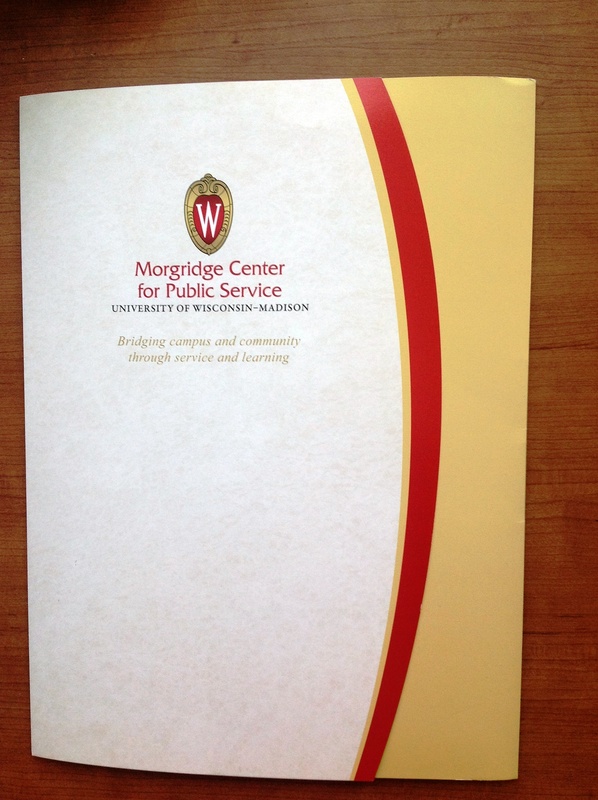 The university center had to overcome the myth that it was well funded. It needed to raise $60,000 in four months. Solution: Working with the center’s director, Foley Media Group engaged colleagues at Rippe Keane Marketing to freshen the Center’s logo and “mark”. Ellen wrote a case statement for fundraising. The statement helped staff and leaders understand the tremendous growth of the center and its funding challenges. Within 30 days, we had created a folder with content cleaned from the case and within 45 days we delivered to a delighted staff the folder and inserts to be used in fundraising visits. We then helped the center director target potential donors and advised on a messaging strategy that included a series of breakfasts with community VIPs and media leaders to solicit thoughts, ideas and recommendations on how to proceed with a winning development strategy. Press releases about events became more professional and distribution increased. The center staff began initial efforts to leverage events and awards for fundraising. 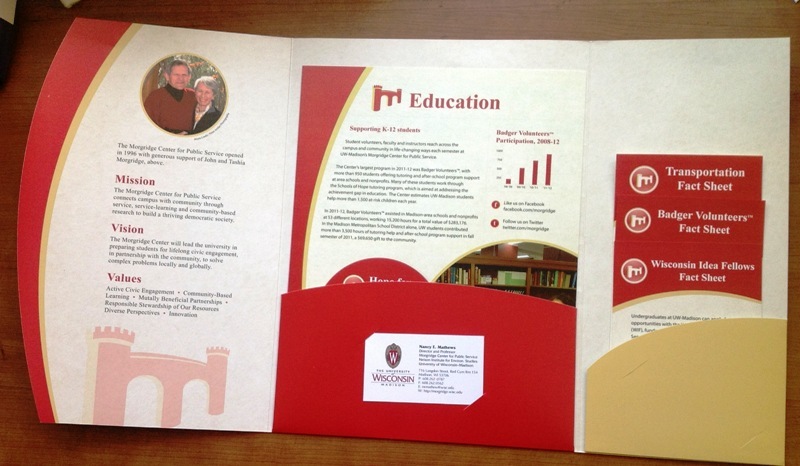 Foley Media Group led the effort to professionally produce a folder that housed evocative fundraising appeals keyed to innovative programs so community VIPs knew the center was following best practices and gaining momentum in fundraising/awareness. The key message to the campus and city communities was that without support, vulnerable children and adults would lose services provided by UW-Madison volunteers, who would no longer have transportation to distant but needy sites. Measurable success: The center director received about $60,000 in funding just before the deadline. Two major media outlets, the Wisconsin State Journal and madison.com, its website in the region, and Madison Magazine wrote supporting editorials or columns about the effort. Staff learned how to create relationships with the media. 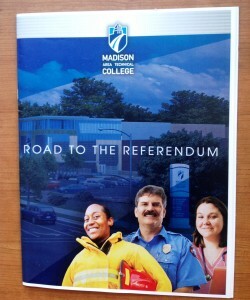 Chal lenge: After a year of debate, Madison College decided to ask voters for $134 million in new taxes to renovate its campus. In an anti-tax environment, Ellen Foley, then an employee of the college, recommended, and the board of trustees agreed that we would run the campaign in a tight timeline of eight weeks to concentrate our message. Our team of three partnered with many College leaders and departments after Ellen was named referendum leader. Measurable success: The referendum won by almost 60 percent and the ensuing good feeling led to the formation of an alumni group and a modern campus.